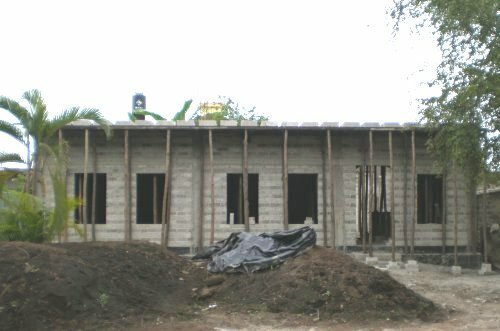 If you are building a house in Mexico, plan on being there during the construction. If not, your house could turn out quite different than what you had planned. Be sure to get a good builder (albañíl). Ask friends and business acquaintances for recommendations, and make sure that the builder is being recommended because he is an experienced and reliable builder, not because he is a great guy. Plan to visit the construction site at least once a day to check on progress. Mexican construction crews make decisions as the work continues, often ignoring blueprints (or, more likely if you are using an albañíl instead of an architect, sketches) that show the dimensions of windows and the placement of electrical outlets. When you are onsite, check progress and make yourself available to answer questions. Try not to micro-manage. Things in Mexico are done differently than they are in your country and if you've chosen a good construction crew, they know what they are doing. But you'll still want to keep an eye on things and correct any mistakes or misconceptions sooner rather than later. Costs: Below are some basic facts about construction costs, but be aware that these are based on our experiences in San Blas, Nayarit, where construction costs are lower than in more touristic parts of Mexico. In most cases, your builder will quote only the labor costs. Plan to spend about 50 to 55 percent above that for materials. Building cost is usually estimated per square meter, and ranges from approximately 3,000 pesos per for a very basic house to 10,000 pesos per square meter for a luxury home with marble flooring and top of the line fixtures. Visit materials store in your area, where you can talk to employees (and construction managers you meet there) to get a better idea what a home in your area will cost. Be sure to let people you deal with know you are keeping an eye on the costs, because it is common to charge gringos more than Mexicans. Landfill: If you are building in a low-lying or wet area be sure to add landfill. Since the fill goes in after the foundation, it is important to let the builders know how much fill you will be adding so they can build the foundation to the correct specifications. If possible it's best to see your property during the rainy season to avoid surprises. Even if your land does not appear to be flooding now, you can expect higher water levels in the future due to global warming or neighbors adding fill of their own. Sand is the cheapest landfill, but in the long run you will be better served by purchasing a higher quality fill for your yard. Currently, in San Blas, sand is 200 pesos per truckload while river bed soil goes for 1,000 pesos per. The higher cost of black jungle soil, at 2,000 pesos per truckload, is due mostly to the transportation costs. 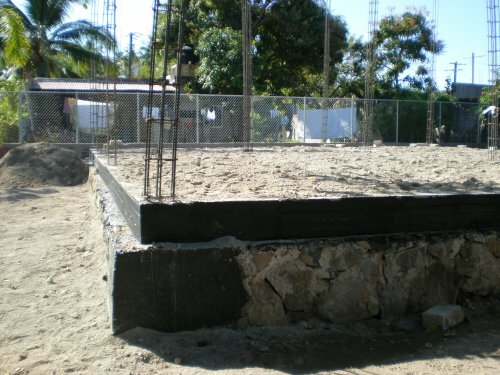 Foundation (cimiento): The building's foundation is made of rock and cement. A house measuring 11 x 9.5 meters takes about three truckloads of rocks at a current cost of 1,100 pesos per truckload. 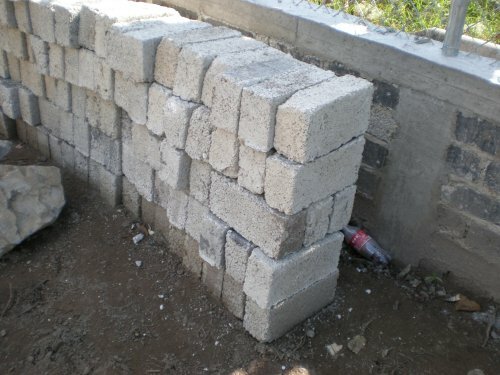 Bricks: While adobe is the traditional building material of Mexico, now most construction is done with bricks (called ladrillos or bloques) or cinder blocks. While red bricks are available, they generally use the gray bricks shown here. Cinder blocks have the advantage that they can be filled with insulation. They are larger and make for thicker walls. 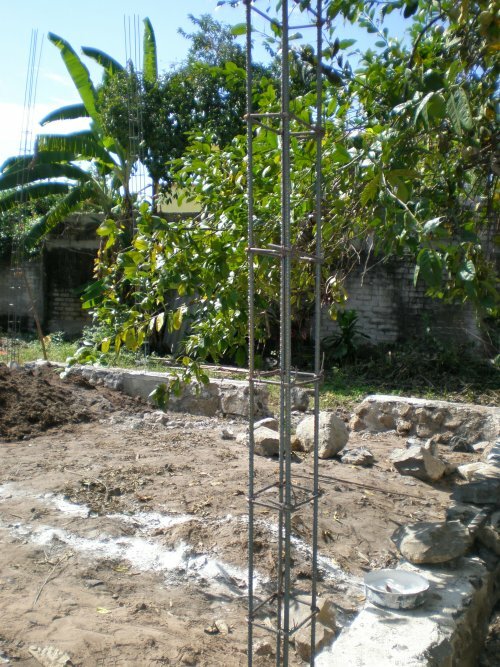 Castillos: Castillos provide the support and are usually placed every 2 to 4 meters. A castillo has a metal rod in the center (called an armex) and is covered by concrete (concreto). Keep in mind as they are building the house that you generally cannot put doors or windows where the castillos are so they need to be stategically placed. As they are building the foundation they will leave holes where the castillos are going to be. Some say the metal rod should be painted to avoid rust, while others say that if the metal is clean and not rusted it is ok not to paint it. You often see these metal rods sticking up on the roofs of Mexican houses. That is because they need to be there if they ever decide to build a second floor. Keep in mind when buying a house that many old Mexican homes are of simple construction and will not support a second floor. You need a strong deep foundation and good castillos to build up. 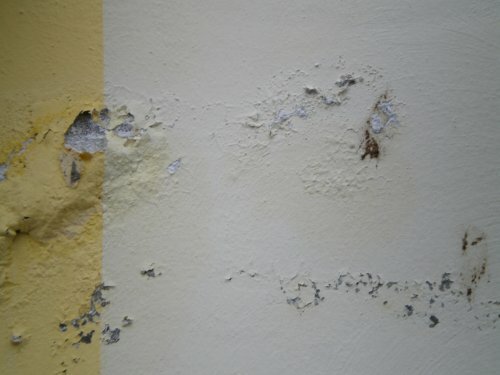 Salitre: Salitre is a salt buildup in the walls that causes the paint to peel. Some believe that the salt creeps up thru the ground during the rainy season while others say that the salt is already in the bricks and morter and gets activated when wet. There is a layer of protection (impermelizante. that you can put on the foundation. The construction crew will not do this unless asked. This is very important if you live in an area where salitre is a problem. Some people also put it in the walls for the first meter. The Dala: A dala is the horizontal version of the castillo. 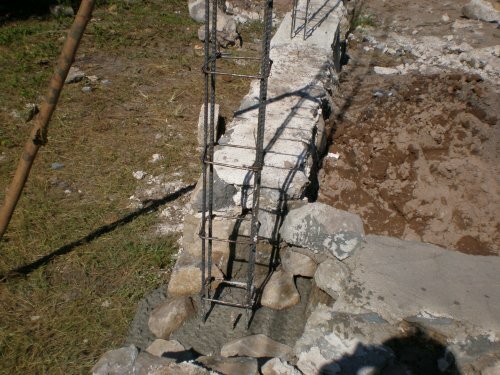 Constructed at the building site, these reinforced concrete beams are created by pouring the wet concrete into a wooden form with rebar inside to sustain the interior foundation and provide the base for the second story, if any, and the roof. After the initial dala, a second one goes in at about two meters. Keep in mind that you cannot have windows, gates, doors or arches going thru the dala. If you want a high arch you need to tell them so they make the dala higher for that section. The Roof: To pour a cement roof (colar), workers first install a wooden frame supported by poles. In regions with high rainfall, a roof commonly has an overhang of one meter to keep sun and water out. Cinder blocks are embedded in a matrix of steel and concrete on top, about 10 cm apart. The tubes for the electrical wiring go in at this point, so you'll need to have decided where you want your overhead lighting, electrical outlets (contactos), and light switches. The form is then filled with concrete. The roof must be poured in one day. If not, it will leak. In tropical regions it is best to install a layer of Styrofoam, which serves as insulation to keep the house cool. You generally have to instruct the builders to add the Styrofoam.